We have been revalidated with our Healthy schools status in April 2016 and are now focusing on our chosen priorities of well being and emotional health which we hope to achieve in the next two years. At Hatch Warren Infant School a healthy attitude to life and learning underpins everything that we do! However, we also make health and health issues a specific focus in terms of teaching and learning. This is achieved directly through our comprehensive Personal, Social, Health Education and Citizenship (P.S.H.E & C) and is reinforced through many other areas of the curriculum. 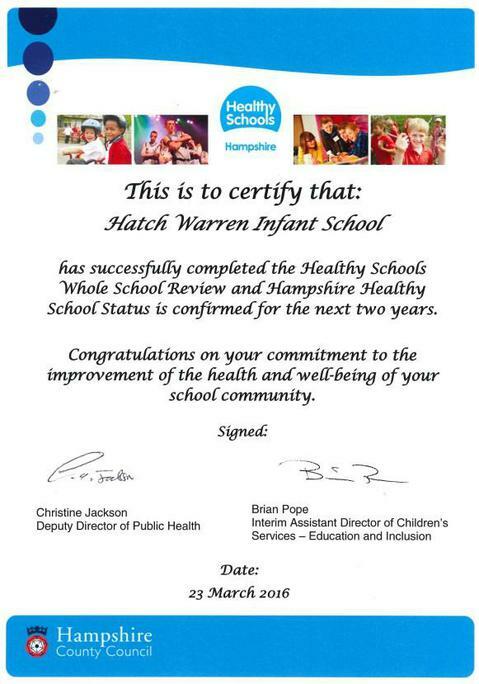 We have achieved the Healthy Schools Award and have successfully completed the annual review. We continue to attain the Activemark Award annually. This makes us healthier and happier. Each year group is taught the importance of a healthy lifestyle, including diet and exercise, from finding out all about ourselves and our bodies in Reception to understanding the importance of the five food groups and a balanced diet in Year 2! As well as the importance of physical well being and fitness, the emotional development and understanding of their role as a global citizen is also imparted to the children. Our Values education covers a wide range of important issues, helping to broaden and shape the children's understanding of their own principles and values and how these have an effect in the wider world. We dedicate a lot of time to developing empathy skills talking about how we feel. We encourage all children to make good choices. The hall is extremely attractive and the quality of the displays on the walls is excellent. There are displays about healthy eating and physical activity. The values of the school are displayed and the expectations of behaviour are clearly visible too. In addition, the achievements of the children form another display. All of these displays are bright, clean and colourful and a great deal of effort has gone into devising and maintaining them. The quality of the relationships is very good. All staff interact extremely well with the children who are happy and chatty. There is a genuine vibrancy about the whole school which is very impressive. All children are catered and cared for really well. Those with particular needs are particularly well served and a growing level of independence is nurtured. The quality of the food is very good. It is well-cooked and well presented by a friendly, caring team in the kitchen. Overall, the atmosphere in the hall is calm and happy making it a nice place to eat and chat with one’s friends which is what a good lunchtime should be. This contributes to us: being healthy, staying safe, enjoying and achieving, making a positive contribution and our economic wellbeing. Every class has a PSHE session each week, as well as individual time as needed. We have "in the spotlight" in Year R and smiley cards around the school that we all share in celebration assemblies. Celebration carrots are awarded weekly for great achievements and a golden carrot tea party takes place each half term to celebrate consistent positive attitudes to school and learning. It provides us with the knowledge, understanding, skills and attitudes to make informed decisions about our lives. We have the confidence, skills, knowledge and understanding to make healthy food choices. We are part of the national scheme which provides a piece of fruit or vegetable per day for each child in school, although healthy snacks can also be sent in from home. All children are encouraged to try fruits and vegetables they may have not eaten before. Our school lunches are excellent, providing healthy, nutritious and tasty food for your children – in fact we recently won a healthy eating award for their standard. We have highlighted some of the more unusual fruit and vegetables in our "plan a healthy meal" challenge. We have an annual healthy week where we celebrate and experience and range of health based activities. We are provided with a range of opportunities to be physically active. We have at least 2 hours timetabled physical activity time each week and also “Activate” throughout the week. We make the most of our large school field at break times and in games lessons. Sainsburys Holiday scheme provides us with sports equipment on an annual basis.We are part of the Sports partnership which means we have coaches come into school and work with us. We have enjoyed multi sports this year. We understand and can express our feelings, are confident and emotionally resilient, and this helps us to become successful Hatch Warren Learners. Links to Healthy Living Advice Websites for Parents. Information for schools and parents. Here you will find lots of information about what you should and shouldn't put in the children’s lunchboxes. Why not try something new! This website aims to help parents as their child develops academically and emotionally. This site offers practical advice to parents on how to understand and approach their child's behaviour. A website with lots of fun recipes and ideas to encourage healthy eating with your child. A website designed to make parents aware of latest safety advice and precautions. Some nice activities children to print and complete too! A website for parents offering help and advice to help your child stay healthy as they are growing up. A lovely website to give you lots of 'green' ideas to try with your children.